Epicor ERP is an industry-specific enterprise solution ideal for distribution, manufacturing, services and retail businesses. It can be deployed on-premise or as a SaaS and supports most popular operating environments. It helps mid-sized and large organizations consolidate data, unearth insights, promote data-driven decisions to drive productivity, efficiency and profits. The ERP has an end-to-end infrastructure that oversees your processes from finance to accounting and CRM to project management and inventory to human resource. Likewise, it manages specific processes like materials planning, value chain and manufacturing. Meanwhile, its business analytics leverages big data and IoT technologies, putting this ERP at the cutting-edge of business solutions. Like many cloud-based ERP, Epicor is modularized so you get to utilize only the features that you need. Moreover, it integrates with other business systems using proprietary on-demand tools--EDI Managed Service--offered as a separate solution. This setup guarantees that the ERP can work seamlessly with your existing system. Epicor can be deployed gradually, module by module, or set up as an end-to-end tech stack. While it has full capabilities to manage your key business processes, from accounting, finance to CRM, project management and to HR and inventory, you can select only the modules that you want. Furthermore, integrating this solution with an existing system is manageable via the separately offered EDI Managed Service. The advantage of a modularized ERP is that you can implement the setup by a department, allowing you time to contain and fix workflow issues, if any, at a smaller scale. At the heart of Epicor are a fully featured accounting and financial management module. It features an extensive suite of tools to help you generate a wide array of reports and statements. The chart accounts feature adapts to a variety of accounting and fiscal setups. Whatever industry you belong, this ERP is likely to be suitable. 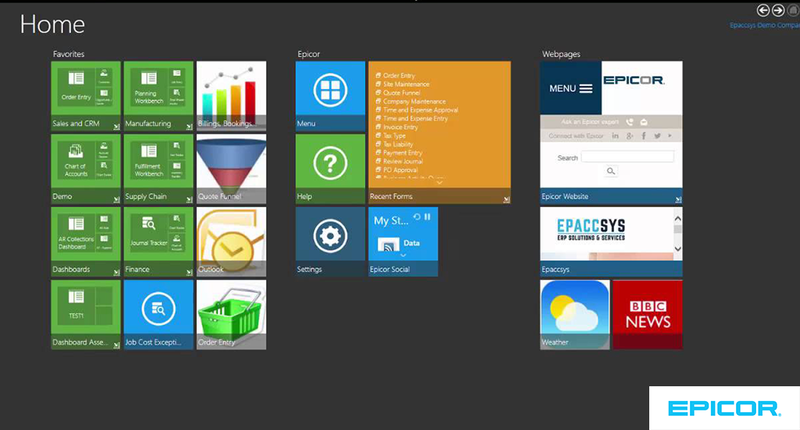 Despite the complexities of its toolkit, Epicor has a neat UI that aids in navigating the tools and modules. It allows you to set the interface either in classic or modern mode, that is akin to a traditional Windows Explorer dashboard or Windows 10 colored tiles. The menu, settings, and help are easily accessible anywhere in the system. The vendor offers an EDI Managed Service On-Demand, which is separately charged, to help you integrate process-specific systems.